Innovation is widely considered as the core driver of nations' economic growth and competitiveness. Since the start of economic reform in 1978, the provincial governments in China have gained much autonomy, which has led to the co-existence of multi-level innovation systems, national innovation system and regional (provincial) innovation system. With the economic development and social progress, the disparities in innovative capacity (I C) among regions in China are becoming increasingly larger. 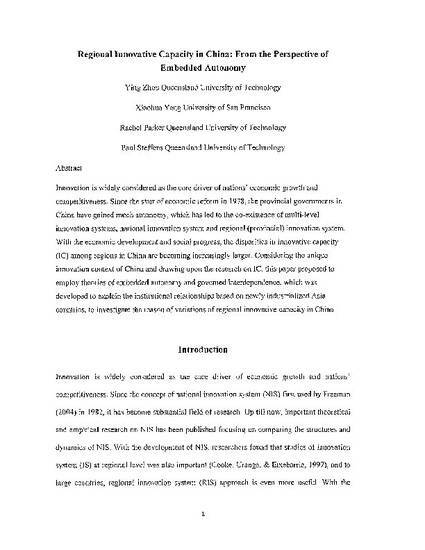 Considering the unique innovation context of China and drawing upon the research on IC, this paper proposed to employ theories of embedded autonomy and governed interdependence, which was developed to explain the institutional relationships based on newly industrialized Asia countries, to investigate the reason of variations of regional innovative capacity in China.